The Leaders-for-a-Day experience did not meet my expectations. It exceeded them by far! As much as I tried to imagine what it would look and feel like, I still could not get it right. 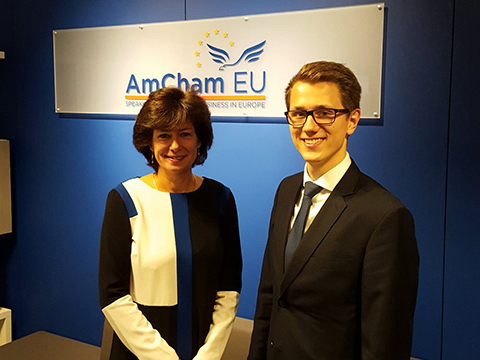 On the 19th of October I was shadowing Susan Danger, the CEO of AmCham EU, at their headquarters in Brussels. The day started with meeting the team and I can say that it was my first big surprise. There were 23 employees and 4 interns, a ratio that I have never seen even in smaller-scope institutions. Moreover, the team, which I initially thought would consist of around 100 people, had at least 8 nationalities represented. But it was only the beginning. During the day I had several aha-moments and could really relate to the topics discussed. Talking more specifically about my leader, Susan Danger, I really admire the way she could stay productive during the whole day, how she coped with unexpected situations and communicated with her team. In addition, the phrases like “what did you learn” or “what is your opinion” were used throughout the day. At these moments I realized what it means to be a true leader. But despite a remarkably intense day, at least for me, Susan had a smile on her face and there was always a little bit of humour in things we did – the important aspect that is often forgotten. experience definitely had an impact on me. Thank you JA Europe, JA Estonia and Susan Danger with the whole team for making my first visit to Brussels unforgettable.